Random Thoughts on Monday Wash Day. It’s Monday and I’m a bit discombobulated. Moreso than usual, and for those of you who don’t know me personally, that’s saying something. Yesterday, Mrs. E. threw a party for my daughter’s classmates and their mothers. After helping with the initial setup and opening of the first few bottles of wine, I was relegated to the master bedroom with my iPod, a stack of magazines and my book. Ignoring the odd shriek, I actually spent an enjoyable afternoon lounging about, offline. That’s rare for me. So today I have a few things floating about in my head not sufficient enough to warrant their own full-length posts. I thought I’d sort of throw them into the wash in no particular order. I think that it says something that the best fashion magazine I read may be “Town and Country.” This month’s issue has two wonderful features that I recommend highly. Pick up your copy and flip through to the story on wearing white and then to the photo shoot that seeks to replicate and update Jacqueline Kennedy Onassis’ timeless style. Fit, proportion, and a sense of what looked good on her all played a big part in Mrs. Kennedy Onassis’ choices. The editors have done her justice and there is only one outfit that I am not that keen on shown in the editorial. What do we take away from the article? Simple, classic, tasteful clothing never goes out of style. Out of fashion perhaps, but not out of style. Update the looks with some fashionable accessories which will be easy to replace when they go out of fashion. When you’re finished with those two stories, flip to the etiquette of the dining table and be reminded, as I was, why it is essential to eat with your children, family or friends. Leave the virtual and online in another room. 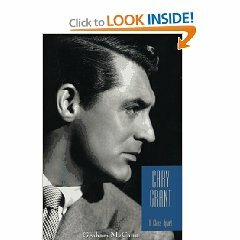 I’m reading a book on Cary Grant. It is an exhaustive study and most enjoyable. The author clearly enjoyed writing about his subject. I am struck by Grant’s reticence when it came to dealing with the press. I’m also amazed with his “rhino thick skin” when it came to allegations made against him. As a blogger who reveals quite a bit about myself in this quest for an everyday elegance, I am envious of his ability to not put a foot wrong. To our list of desirable traits, we should add: the ability to stick, politely, to one’s guns. Being a decent and essentially optimistic person is a fine goal to pursue. Character counts. I’ll vouch for my tailor’s character. He’s in Northern Virginia and Washington today, tomorrow and Wednesday. Drop him a line if you’d like to schedule an appointment. Finally, a bit of sartorial advice. I spent the weekend wearing a favourite pair of trousers (aside from a dinner party to which I wore my new jeans as requested by the hosts.) 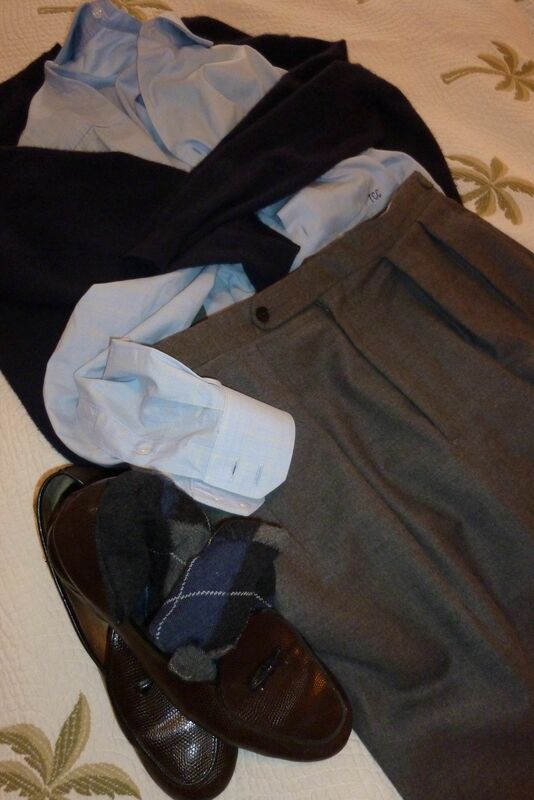 They are a medium grey flannel, full cut with double pleats, side straps and two inch cuffs (turn ups). ADG would approve. They are extremely comfortable and pair well with sportcoats or a simple shirt and cashmere sweater combination. I caught a glimpse of myself as I wandered past a mirror in the bedroom last evening and I was reminded of this fact: flannel, like a pair of dress shoes, should be rested between wearings. This entry was posted in Cultivating, Elegantology, Living and tagged ADG, Cary Grant: A Class Apart, Flannel trousers, Jacqueline Kennedy, Leviner Wood Custom Tailors and Shirtmakers, Town and Country Magazine. Bookmark the permalink. 6 Responses to Random Thoughts on Monday Wash Day. Yes, I agree, Town & Country is one of the best and most elegant magazines. It is a perfect forum for an article about Jacqueline Kennedy. I’ve read this magazine for more than 3 decades and always enjoyed it. It is one of the few journals related to lifestyle that avoids sensationalism, trends, and shock tactics. You’ll never see the outre and sometimes vulgar outfits shown in Vogue. It used to be a little bit more elitist, but has lost that aspect with societal changes. I cannot recommend it highly enough. Mr. Sheridan, Splendid! Thanks for the link. What a nice treat to have another Grant article to read this morning. I’ve read Higham and Mosesly, Eliot, and Donaldson and Macintosh. I’ll look into Shickel’s effort next. Mr. E, I also enjoyed the same feature in T&C on Jackie O style. I am curious–which ensemble did you not like? There was one in particular that I didn’t care for either, and I am wondering if it is the same one. I loved the gorgeous blue YSL linen dress. Happy, and looks so easy to wear! Paula, the LV cargo pocketed coat (p. 150) makes no sense to me whatsoever. It is completely out of balance to begin with. Ditto–the pockets that ate Philadelphia! After two wearings, this coat would feel old and annoying.